Do you expect an ultrathin and super flat wireless presenter to give you a hand on showing yourself when giving a speech in a momentous occasion? Don't you want to give your boss and colleagues a perfect impression when reporting works in the conference hall? 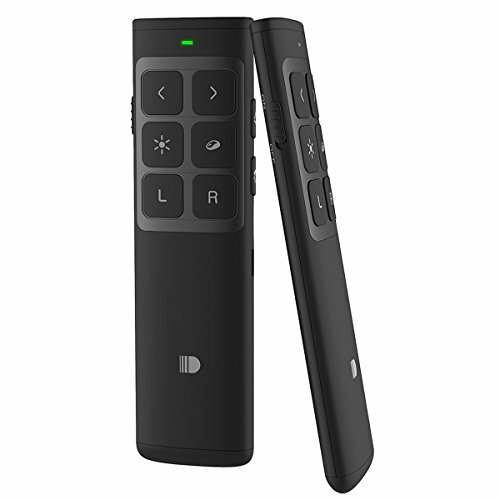 Come on, our Doosl wireless presenter will totally satisfy your needs of free show. Don't hesitate to get one presentation remote and put into your tasks required. 1. Be warned that 2.4GHz pointers are not toys; they should never under any circumstances be directed into people's eyes or at passing aircrafts. 4. Don't directe at people or animals, or it can be dangerous. Plug-and-play wireless USB receiver - USB wireless receiver stores inside the presenter for easy pack up and portability, No waiting. No hassles. No software to install. Just plug,play and go. Operation system: Windows 2003, XP, Windows Vista, Windows 7, Windows 8,Windows 10,Mac OS, Linux.